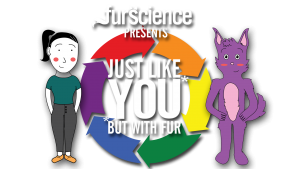 Starting December 1, continuing every Thursday for the month, Furscience will be releasing its evidence-based, anti-stigma, PSA-style, tongue-in-cheek, web series to promote public awareness of furries and their fandom and to encourage people who have questions to seek scientific answers, not turn to Youtube (unless it’s Furscience!) or fictionalized portrayals (CSI, we me you!). It takes the more G-rated versions of what people mistakenly assume furries do “in their fursuits” and plays that out because, behind the fursuit is a person, just like you who goes wine tasting, for example. All of the videos will be released on both Youtube and Vimeo here, so share, like, comment, like, share, and share some more because the more people see, the more people are aware. These videos were a lot of work (more to say on that later), but they were fun to do at the same time. Many people were involved in the creation of these videos (way more people to thank later! ), so please do check out the credits at the end of each video. If you want to comment on a video, but don’t want to do so publicly on the various video platforms, or have any suggestions for the type of video series you’d like to see in the future, please contact feel free to contact Dr. Sharon Roberts or the Admin for this page.